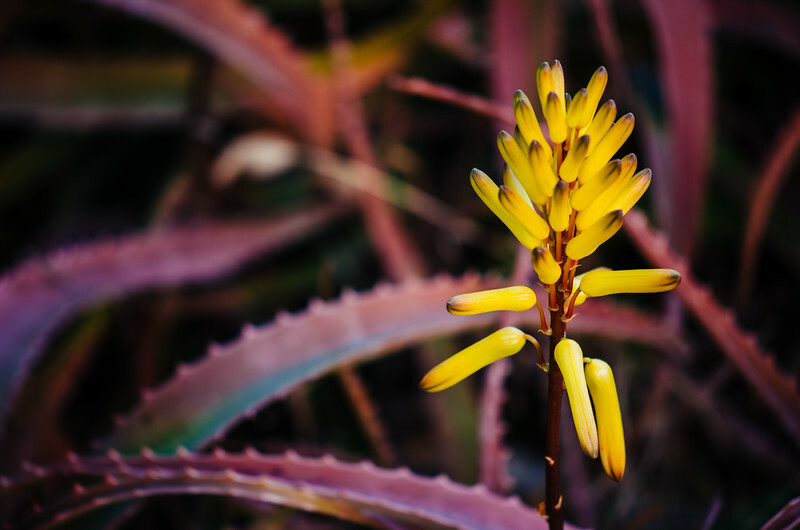 Yellow aloe plant at the Huntington Gardens. Click above to see larger. I really like this one -- and spent some time with the camera on the tripod trying to get it right and set the yellow against an interesting tangle of cactus leaves in the background. The photo was taken with my Nikon D5100 and my lovely new Nikon DX 85mm micro lens. I also fired the built-in flash on the camera as it was shady in this spot. The photo was shot in RAW and processed in Lightroom using VSCO film presets. Please see more of my work at my SmugMug site, where prints are available at affordable prices -- 8 x 12s start at $11 and SmugMug uses a good print lab. You can also follow me on Twitter; every time I tweet, I lose two followers so it's time to replenish.